Final Hour is recapped, and Kross looks fantastic in clip form. Impact is taping from Sam’s Town in Vegas, which remains looking as terrible for Impact as it does for ROH. Tessa faces Rae Lynn, and gets some nice shots in. Tessa holds onto the ropes to avoid a whip and faceplants her. Tessa lands the buzzsaw DDT and wins it. She tells Taya that she’ll never be more than Johnny’s wife and can’t beat her. Taya runs down and Tessa runs away. Taya says that she’s talked to Impact management and she’ll get her shot at Homecoming. KM and Fallah Bahh gamble to try and win enough money to impress Scarlett. A goofy That ’70s Show pot smoking bit airs with Dezmon Xavier and two men who aren’t identified and we get a laugh track. Bahh and KM face LAX, with Bahh looking impressive against them. They do the stereo rolls, but KM gets accidentally DDTd by Bahh when he eats a dropkick. KM eats a double dropkick to the knee and a PK before a springboard legdrop ends it. Heather Monroe talks about being the goddess of girl power before Kiera Hogan warns her about Su Yung. LAX meets backstage before we get the LAX match from BFG as the GWN app match. Sydal and Ethan Page yammer on about the third eye nonsense for a bit. Gama Singh and the Desi Hit Squad relax poolside. Eli cuts a promo in a mustard yellow jacket before Tommy Dreamer comes down and talks about how revolutionary ECW was 25 years ago and then they bicker. Alisha shows up with Moose and his girl dressed up like she’s from 1975. Scarlett chats with refs about how in shape they are. Johnny Impact and Matt Sydal have a perfectly fine little match. Johnny hits a crazy over the post corkscrew dive onto Page before Sydal throws him into the barricade. Moonlight drive counters the modified Samoan drop and the starship pain ends it. Killer Kross comes down and says he respects Johnny’s fighting spirit. He respects that he isn’t protected here, unlike other companies. He says everyone wants a piece of Johnny but him – because he was impressed at Final Hour, so if he needs help, he’s here for him. He tells Kross he doesn’t trust him and leaves. Katarina chats with Jordynne Grace about being her partner and says she couldn’t beaven her on another night – so Jordynn offers up another match in two weeks. 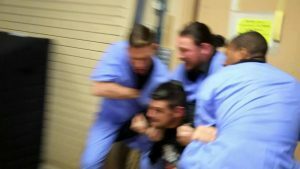 Eddie and Moose brawl and what’s worse, Alisha yells throughout this and the white coats take Eddie to the loony bin. Eli’s turkey trot is hyped up for next week. Su Yung faces Heather Monroe and takes her out with the mandible claw. Dark Allie comes out with paint and Su takes out Kiera and leaves with Allie. Sami comes out to face Cage for the X Title. Sami uses his goons to get an edge and gets 2 off a corner DVD. He gets an ankle lock, but Cage escapes and lands a pumphandle facebuster. Apron powerplex hits and lands the F5 for 2. Sami gets a sunset bomb for 2, but a powerbomb and drill claw end it. 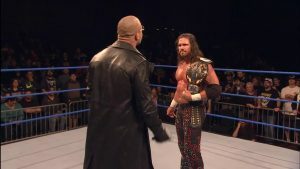 Cage cashes in the X Title for a shot at Johnny Impact on Homecoming – so Option C is now just something anyone can use whenever.